Union Cabinet adds 15 new castes to the Central OBC Quota. 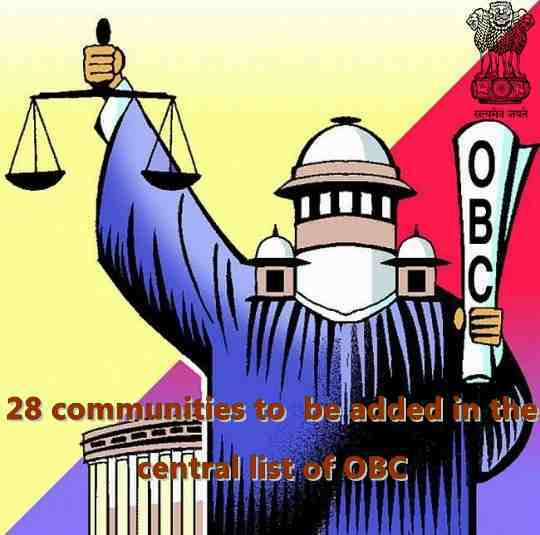 The Union Cabinet has approved the inclusion of the 28 communities to the central list of Other Backward Classes (OBC). Out of the 28 communities included in the central list, 15 are new entries while 9 were sub- castes and 4 were corrections. By adding these communities, people falling under the cast will get the benefits of the reservation of the seats in Central Educational Institutions, government services and posts as well. Students from these 15 castes will become eligible for the various scholarship schemes such as ONGC Scholarship, welfare schemes and also for the National Fellowship for OBC Students. They will also become eligible for the benefits which are at present available to the persons belonging to the Other Backward Classes being administered by the Central Government. The changes made by the Union Cabinet will be beneficial for the communities which are going to be a part of the central list of OBC as they will be able to avail the reservation in education as well as other sectors. In the recommendation of NCBC, the total of 2,479 entries has been notified in 25 states and six union territories for inclusion. The NCBC research appeals for the inclusion of any class of citizens and hears the complaints of over inclusion and under inclusion of any backwards class in such list.